Join the discussion on our forums! Come discuss Lyra the Sunshard over in our dedicated Lyra the Sunshard discussion topic. The way she sounded before had presence. She was commanding that you look at her bright and powerful beauty. She knew she was a better version of whatever stood before her. Her voice sounded elegant, wise, strong, powerful, like as if she went into many battles and came out triumphant every time. Now I don't know what she sounds like but I don't like it. I would love if the correction had never occurred. Late reply but yeah I dusted my gold copy when they changed the voice, blizzard for some reasons love to downgrade their voice actors. That's the stupidest reason I've ever heard for disenchanting something. why does Lyra have different pitched voices? Her voice is much more.... womanly now ingame. Guess they made it clearer. Thx a lot! I'm so happy! why does this card sound like a female here but male in-game? Opened this lass a week ago, thought of spare parts and immediately built a deck. Finicky Cloakfield has created some very interesting games! Just crafted her golden finally after months of using the regular version. My favorite legendary by far! It's my favorite legendary because it's extremely fun to play & I like the art/animation of the card. Yes, the spells you get are random, but additional resources are huge in this game. Everyone knows this card is extremely dangerous if left on the board. Priest has a lot of good spells that can swing the game with removal or minion generators. 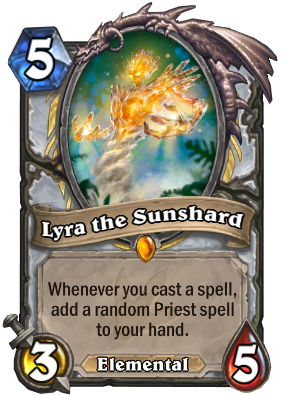 Lyra is a card to include in most priest decks, simply because she demands removal. I play this card in my Raza priest, so my deck isn't built around this card. The strategy is just play it with a spell or two & see what you get. If they can't deal with it when it's on the board, it can completely change the game. It's just a matter of preference, friend. RNG has & always will be, a part of Hearthstone. I really just enjoy playing the card & it has provided some of my most memorable moments in this game. I understand that it might not be your cup of tea, but priest is my favorite class & I enjoy the spells. If you don't like this card, that is perfectly understandable. However, if I may ask, what brought you to the page of a card you do not enjoy? Ok I just love how you're not offended by my comment. We have a different perspective on the game which is ok. I opened the Lyra page to compare the votes on it to the votes on Raza and Kazakus.I must say i was surprised on how good they were all rated, Kazakus and Raza 63% and 57% meta defining and Lyra 28%. Lyra and Raza see an equal amount of play: Lyra is in 36,5% of Priest decks and Raza in 35,5%. Raza is more popular than I was aware of. If only for the reason that Raza cannot be played in decks that contain doubles... I currently play DK Kazakus Raza deck. I craft Kazakus and Raza yesterday for it. I am blown away by the power of the extra 2 damage after each played card when Raza and Shadowreaper Anduin have been played. Maybe it also synergizes with Lyra for playing cheap spells with 2 dmg bonus per played card might make it even more powerful. What do you think? Yep that's exactly how I use her. If I'm on the coin, I'll usually try to save it for lyra. Sometimes I'll throw her out there if I have an empty board or my opponent just played removal. If she's left on the board, she either gives you tons of cheap spells which are fuel for your hero power, or big ones like free from amber or mind control, which can be game changers. There's really no downside to including. I've machine gunned people down from 20 health from hero powers before just with lyra on the board. So I think you should definitely craft her if you haven't already! Opened this card like three days ago and now I am a priest Player. Very good card. So true ! The intro gives me the chillz every time. Way better elemental stable priest deck than Ozruk would be. With Ozruk, you are hoping to play little elementals to high health it. But that rarely works. With Lyra, it is WAY easier to pull off. One of the few cards with a beautiful flavor text, it is kinda poetic.